TORONTO, March 28, 2019 /PRNewswire/ - Golden Star Resources Ltd. (NYSE American: GSS; TSX: GSC; GSE: GSR) ("Golden Star" or the "Company") announces its Mineral Reserves and Mineral Resources estimate as of December 31, 2018 with a 6% increase in total Mineral Reserves after depletion, including a 47% increase in Wassa Underground Gold Mine ("Wassa Underground") Mineral Reserves. "The updated Mineral Reserve at Wassa Underground shows a significant increase, specifically in the upper levels of the mine, and strongly suggests that there is excellent potential to increase our production rate in the near term. In addition, the increase of over 1 million ounces of gold in Inferred Mineral Resources at the Wassa complex to over 6.4 million ounces of gold further demonstrates the potential for the mine. The Company continues to improve its view of the orebody and I am very excited by how Wassa Underground is turning into a world class mine. "At Prestea, the mine is endowed with good infrastructure and the focus remains on improving operations. The Company continues to address the ramp up challenges with the Alimak shrinkage mining method, and expects steady productivity improvements this year from the mine." Mineral Reserves were estimated using a gold price of $1,250 per ounce. Mineral Resources were estimated using a gold price of $1,450 per ounce. During 2018, Golden Star's Proven and Probable Mineral Reserves increased by 97,000 ounces, primarily as a result of positive conversion of Mineral Resources at Wassa Underground. The stated Mineral Reserves comply with the requirements of National Instrument 43-101 – Standards of Disclosure for Mineral Projects ("NI 43-101") and are classified in accordance with the Canadian Institute of Mining, Metallurgy and Petroleum's "CIM Definition Standards – For Mineral Resources and Mineral Reserves". Mineral Reserve estimates reflect the Company's reasonable expectation that all necessary permits and approvals will be obtained and maintained. Mining dilution and mining recovery vary by deposit and have been applied in estimating the Mineral Reserves. Mineral Reserves are the economic portion of the Measured and Indicated Mineral Resources. Mineral Reserve estimates include mining dilution at grades assumed to be zero. The 2018 Mineral Reserves were prepared under the supervision of Dr. Martin Raffield, Executive Vice President and Chief Technical Officer for the Company. Dr. Raffield is a QP as defined by NI 43-101. The Mineral Reserves at December 31, 2018 were estimated using a gold price assumption of $1,250 per ounce. The slope angles of all pit designs are based on geotechnical criteria as established by external consultants. The size and shape of the pit designs are guided by consideration of the results from a pit optimization program. Cut-off grades have been estimated based on operating cost projections, mining dilution and recovery, royalty and stream payment requirements and applicable metallurgical recovery. Marginal cut-off grade estimate for the Wassa open pit is 0.7 grams per tonne ("g/t") of gold ("Au"). Break-even cut-off grade estimates for the underground mines are as follows: Wassa Underground 2.4 g/t Au; and the Prestea Underground Gold Mine ("Prestea Underground") 7.0 g/t Au. Prestea Underground Proven Mineral Reserve includes underground broken stocks. Only non-refractory material is included in Mineral Reserves. Figure 1 provides a reconciliation of the Company's Proven and Probable Mineral Reserves from December 31, 2017 to December 31, 2018. The total Wassa Mineral Reserve has increased by 23% after 2018 mining depletion. This increase is attributable to strong results from the 2018 underground definition drilling program combined with a stope design optimization process. Drilling from surface has extended the Indicated Mineral Resource approximately 65 metres ("m") to the south and a hanging wall drive has allowed the definition drilling to access areas to the south of the current stoping area. Open pit Mineral Reserve tonnes have reduced by 20% and the grade has increased by 20% resulting in equivalent ounces. This change is as a result of increasing the marginal cut-off grade from 0.6g/t in 2017 to 0.7g/t in 2018 to account for a royalty payment that was omitted in 2017. The Mineral Reserve ounces have remained the same due to an increase in the rock density estimate following extensive testing and changes in the resource model. At Prestea the open pit Mineral Reserve was depleted in 2018 and additional material was mined during the year that was outside of the reserve estimate. The underground Mineral Reserve has reduced by 146,000 ounces as a result of 2018 mining depletion and changes to the resource model following definition drilling and underground development. The new interpretation of the resource includes areas defined by drilling and raising where fault movement has resulted in areas of ore loss within the planned stopes. The interpretation of the plunge of the high grade core of the resource has moved to the north of the current stoping area. This has resulted in loss of Mineral Reserves between 24 and 27L. Exploration drilling is currently being carried out in this northern area, both above and below 24L, and the expectation is to be able to identify additional Mineral Resources during 2019 to replace these losses. Golden Star's Mineral Resources at its two assets, Wassa and Prestea, decreased slightly in 2018. Golden Star's Inferred Mineral Resources increased by 13% to 7.2 million ounces during 2018, with the increase delivered primarily at Wassa through step out drilling with additional contributions from Father Brown, as was previously reported on February 19, 2019. Some statements contained in this news release are "forward-looking statements" within the meaning of the Private Securities Litigation Reform Act of 1995 and "forward looking information" within the meaning of Canadian securities laws. 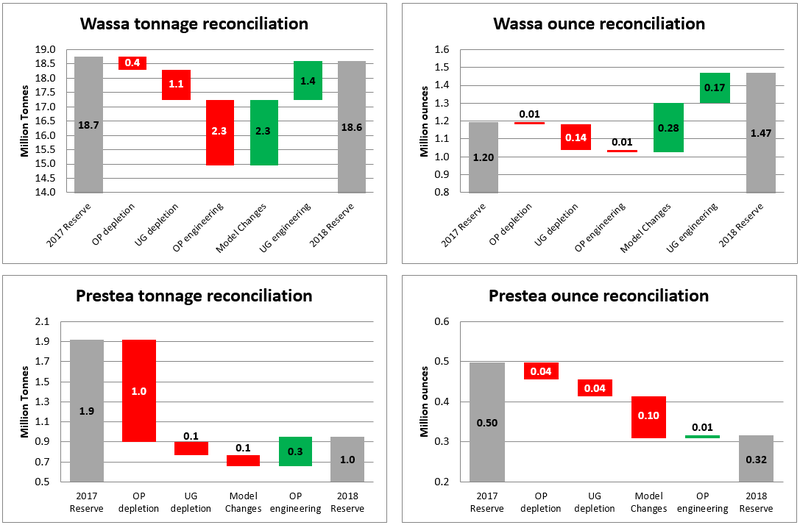 Forward looking statements and information include but are not limited to, statements and information regarding: the potential to increase production rate of Wassa Underground in the near term due to increased Mineral Reserves in the upper levels of the mine, the expectation of steady productivity improvements in 2019 at Prestea, the expectation of being able to identify additional Mineral Resources at Prestea during 2019 to replace losses, the selection of lower cut-off grades for underground mining at Wassa Underground and Father Brown Underground, and 2019 production guidance and cash operating cost per ounce guidance. Generally, forward-looking information and statements can be identified by the use of forward-looking terminology such as "plans", "expects", "is expected", "budget", "scheduled", "estimates", "forecasts", "intends", "anticipates", "believes" or variations of such words and phrases (including negative or grammatical variations) or statements that certain actions, events or results "may", "could", "would", "might" or "will be taken", "occur" or "be achieved" or the negative connotation thereof. Investors are cautioned that forward-looking statements and information are inherently uncertain and involve risks, assumptions and uncertainties that could cause actual facts to differ materially. There can be no assurance that future developments affecting the Company will be those anticipated by management. Please refer to the discussion of these and other factors in Management's Discussion and Analysis of financial conditions and results of operations for the year ended December 31, 2018. Additional and/or updated factors will be included in our annual information form for the year ended December 31, 2018 which will be filed on SEDAR at www.sedar.com. The forecasts contained in this press release constitute management's current estimates, as of the date of this press release, with respect to the matters covered thereby. We expect that these estimates will change as new information is received. While we may elect to update these estimates at any time, we do not undertake any estimate at any particular time or in response to any particular event. The Mineral Reserve and Mineral Resource estimates have been compiled by the Company's technical personnel in accordance with definitions and guidelines set out in the Definition Standards for Mineral Resources and Mineral Reserves adopted by the Canadian Institute of Mining, Metallurgy, and Petroleum and as required by Canada's National Instrument 43-101 – Standards of Disclosure for Mineral Projects ("NI 43-101"). Mineral Reserve estimates reflect the Company's reasonable expectation that all necessary permits and approvals will be obtained and maintained. Mining dilution and mining recovery vary by deposit and have been applied in estimating the Mineral Reserves. The Mineral Resource technical contents of this press release have been reviewed and approved by S. Mitchel Wasel, BSc Geology, a "Qualified Person" pursuant to NI 43-101. Mr. Wasel is Vice President Exploration for Golden Star and an active member of the Australasian Institute of Mining and Metallurgy. The 2017 and 2016 estimates of Mineral Resources were prepared under the supervision of Mr. Wasel. The Mineral Reserve technical contents of this press release, and the 2017 and 2016 estimates of Mineral Reserves, have been reviewed and approved by and were prepared under the supervision of Dr. Martin Raffield, Senior Vice President, Project Development and Technical Services for the Company. Dr. Raffield is a "Qualified Person" as defined by NI 43-101. Additional scientific and technical information relating to the mineral properties referenced in this news release are contained in the following current technical reports for those properties available at www.sedar.com: (i) Wassa - "NI 43-101 Technical Report on a Feasibility Study of the Wassa Open Pit Mine and Underground Project in Ghana" effective date December 31, 2014; (ii) Prestea Underground - "NI 43-101 Technical Report on a Feasibility Study of the Prestea Underground Gold Project in Ghana" effective date November 3, 2015; and (iii) Bogoso - "NI 43-101 Technical Report on Resources and Reserves Golden Star Resources Ltd., Bogoso Prestea Gold Mine, Ghana" effective date December 31, 2013. This press release uses the terms "Measured Mineral Resources" and "Indicated Mineral Resources". The Company advises US investors that while these terms are recognized and required by NI 43-101, the US Securities and Exchange Commission ("SEC") does not recognize them. Also, disclosure of contained ounces is permitted under Canadian regulations; however the SEC generally requires Mineral Resource information to be reported as in-place tonnage and grade. US Investors are cautioned not to assume that any part or all of the mineral deposits in these categories will ever be converted into Mineral Reserves. This press release uses the term "Inferred Mineral Resources". The Company advises US investors that while this term is recognized and required by NI 43-101, the SEC does not recognize it. "Inferred Mineral Resources" have a great amount of uncertainty as to their existence, and great uncertainty as to their economic and legal feasibility. It cannot be assumed that all or any part of Inferred Mineral Resources will ever be upgraded to a higher category. In accordance with Canadian rules, estimates of Inferred Mineral Resources cannot form the basis of feasibility or other economic studies. US investors are cautioned not to assume that any part or all of the Inferred Mineral Resource exists, or is economically or legally mineable.